Getting to grips with a new car can take time, as one woman taking a test drive at a US car dealership has clearly shown. A young woman, who has not been named, visited the Sterling McCall dealership in Houston, Texas wanting to take a Toyota Camry out for a test drive. Unfortunately, things quickly went wrong. In fact, she did not even make it off the forecourt, miraculously getting the car wedged between two other cars parked at the dealership, with the images of the unsuccessful test drive soon surfacing online. Car dealerships can protect themselves against the risk of potential customers crashing their vehicles while on a test drive by getting demonstration cover as part of a combined motor trade insurance policy. As long as the customer has presented a valid driver's licence and is accompanied by a member of staff from the dealership, they will be insured while behind the wheel during the test driver. For members of staff working at a car garage or dealership, they too will be called upon to get behind the wheel of new and unfamiliar vehicles on a daily basis. A road risks insurance policy will offer valuable cover in case they should suffer any similar misfortune. 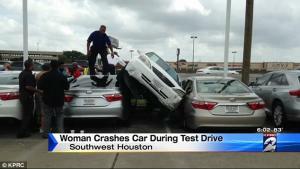 In the case of the forecourt crash in Texas, KPRC reports that the test driver was accompanied by her father and a salesperson at the time of the accident. All three were unharmed.